Ive been considering light options for them. During this process I keep toying with the idea of putting a sealed beam beacon on my truck. But seriously, Ill go with something modern for their trucks as they are usually in traffic, roadside, etc. Whereas I am usually only out on site if they are already there working. Ive thought about throwing on a 'modern' 2/4 beam rotator just for fun. Any suggestions on current manufacturers? Can't go wrong with a good old Fedsig or Grote. They do pull some power though...more modern vehicles can be finicky (canbus) on power draw. I've seen body control modules get nuked by strobe packs...that's a $400 part in itself. 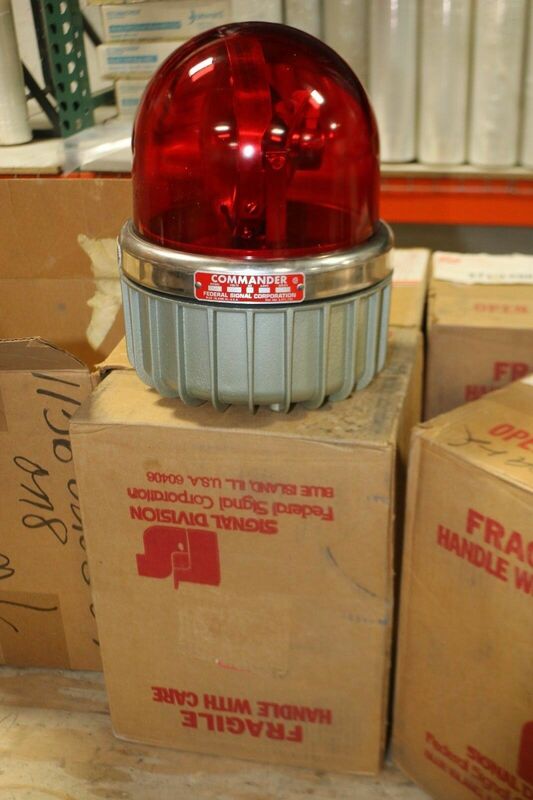 You could go for a big LED beacon like Whelen L or 2 smaller LED beacons that sync. Pricey though. I say go with an amber LED rotator like the Michigan State Police use. I can't say I'd rely on any modern Grote beacon like the 76203 you listed. I have about 6 of them (last count) that were factory installed on Trucks from the dealer. Out of those 6, 4 needed to go back to Grote for various reasons.. bulbs not lighting.. motor issues and various electrical shorts. These are cheap beacons.. and I would not stake anything on them.. I make use of them for display, but that is about it. I was suspicious of the Grote beacons having found even the 4 bulb versions for under $100, your reply confirms so I’ll rule those out, thanks. Any word on the PAR46 TriLite? They are pushing $300 but I know they’ve been around for a long time so my assumption is that they are quality. Bulb replacement will be pricey but 46’s do have some punch, and my budget should cover a number of replacements. To those that mentioned LED rotators, thanks but my thought for this is something old school fun. Not to mention he fact that every LED “rotator” I’ve seen in person sucked big time. One of our FDs newer trucks came preset with faux-rotator patterns, I honestly thought the FS14’s on one of our backup rigs were more effective. Why not mix old school and new....PAR46 LED Spotlight bulbs, in a older FEDSIG model? Would need to get a good host before even considering that. I am also up for any suggestions on a bar mount. Does anyone even still make a no drill clamp style bar anymore? I don't believe Federal had a PAR46 model. Tripp-Lites were a heavy duty light, seemed to last forever. The model you are looking at is HUGE! One advantage to halogen/incandescent in snow and ice, the dome will stay clear of build-up, due to the heat of the bulbs. The Trilite and the 400X are huge and cost accordingly. The 400X is only PAR36 but makes up for it with a slower 120 FPM rate for its 4 bulbs so you have a longer dwell per flash. I think from a distance both would appear fairly similar unless you put aircraft bulbs (#4537) in the Trilite. That being said, the FedSig 100 and Sentry use the old Streethawk rotator and are 85,000 CP, they are ridiculously bright in amber plus the beacons themselves and replacement bulbs are a fraction of the cost of the Trilite and 400X. I'm always happy to see more sealed-beam rotating beacons out there. Nothing pops quite like them, and +1 on their usefulness in cold weather climates thanks to the heat they tend to generate. The North American Signal 400X is incredibly impressive in person IMO. The only PAR46 beacon Federal Signal ever made was the 371L Commander, and that was for 120v-250v applications mostly. Never seen a 12v version. I'm guessing if you really wanted to, you could gut the AC components of a Commander and swap for 12v...but that sounds like a crap-ton of work...and headaches. 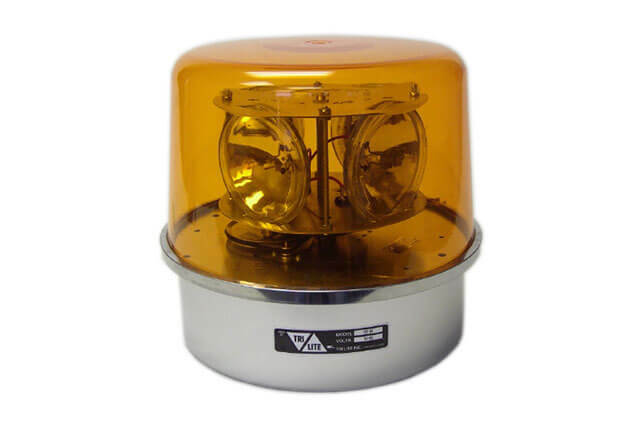 Second....The Tri Lite Mark 12 beacon is a very versatile beacon for its size and has effective warning power at long distances. They come standard with 4435 35W par46 bulbs, but you'll need to find a Tri Lite Mars distributor in your area to get the 12 volt version of the Mark 12. You'll have approximately 6 amps of power draw with those 4435 bulbs. The two-bulb, 12 volt Tripp Lite versions were actually called the S-200, and had a different bulb carriage design (round plate vs C-channel like the current Tri Lite and later Tripp Lite models). But, finding those for a good price is really hard to do. ......and the S-75 model, a hill light version, with two angled par36 bulbs, one up, one down, off to the sides of the C-channel bulb holder in specialized holding plates, and two par46 bulbs on the horizontal plane....VERY hard to come across nowadays. This one is part of my collection, nestled between my own 120v Mark 12 Tri Lites and powered by a 36 amp power supply ! Note: If you decide to get higher wattage bulbs, it's best to hardware the beacon to with 30A relay, matching amp in-line fuse, and switch. I hope all this info helps ya out, LineSpotter ! Good info, thanks for the input thus far. Finding a no drill bar to mount the light to. Fleet doesn't care what I do so long as I don't drill the roof, but all the clamp style bars Im finding have low weight limits well below even smaller beacons. All the manufactures Ive found thus far state their 'gutterless' mount bars are only good for around 4-6 pounds or one can risk them popping off. I could maybe skip the bar and fabricate a plate to mount the beacon and add magnets, but I might risk trashing a motor (at best) if they strong enough (neo) to hold that sort of weight safely. I had originally toyed with the idea of a pole mount in the bed but fleet 'got a deal' on aluminum side opening bed-covers that do not allow access to the bed for mounting. Magnetic FireBeam. Super bright, better than sealed beam (68000 candlepower), and none of your above mentioned issues. I use a heavier magnet with a rubber cover...excellent in all aspects. Dan has a point. The Federal Firebeam has a great punch in a small package. One dash/throw light Federal should never have discontinued. Couple of amber ones on Ebay with BIN option. If you still want to use the 12V Mark 12 with a cigar plug, you can easily attach these 250# magnets to the bottom since there are mounting holes pre-drilled in the base of these beacons. You will need to fill the rest with RTV silicone to seal the base pan completely after. That might be your best bet if you still want to use the Tri Lite beacon. Fits Dodge, Fords and GM's.... but suggest reading for your years / Models..
Ive used those before when we were running F series trucks. Unfortunately they do not make them for the Frontier. BackRack is not an option, due to the bed covers? The doors have a contoured edge that sort of seals the bed (they are junk) which totally eliminates any such mount. Our fleet manager is a clown and literally refuses any input from the field, even if it means saving money/time. These covers actually make my guys job harder and cost more than the simple boxes I originally asked for. I’ve considered that option or even a pair mounted on a modern bar (weight may be an issue). Someone has a whole pile of NIB amber Skybolts (the plastic ones) I’ve considered as well. But if I do this my first preference would be to make it a large beacon, twin 46 or quad 36. How about a Whelen RB6T? $125 on Strobesnmore. Fireball magnets of any model are unavailable. However, there is a seller on eBay that's selling circular magnets up to 150# pull each. Don't believe those would accidentally come off.